We started with the idea we’d keep Fiona out of Praveen’s hair helping a few local women learn some skills to increase their income…. 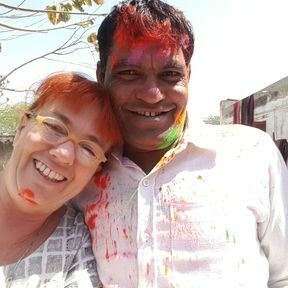 Well Fiona’s Hindi is poor and so she dragged Praveen out to the village to help her communicate….and now years later we have a huge gang we work with in our local area and contacts across India we go to, to directly source khadi handlooms. The Stitching Project is dedicated to making fine textile products...we are based in rural India, our style is a little bit ethnic and a lot contemporary. The Stitching Project is a social enterprise; that is a business dedicated to producing quality work, which will contribute to the ambience of the purchasers’ environment whilst contributing fairly to the livelihood of the producers. We are a big bustling team of people working together for the benefit of all here to make lovely things for you there. · Fabric mostly khadi handlooms sourced directly from the weaver, we supply details on a small tag attached to the garment. Khadi handloom is hard wearing cloth, that gets better with age. · Khadi has small irregularities in the weave- we check and reject major faults, but small ones will show up from time to time. · The silk cotton comes from family operated small powered looms. · We clearly mark the source of the fabric. Plant Dyes will age and fade gracefully. - Dry in shade and air. - DO NOT use strong chemicals, beach, enzymewash, soaker. - Can be composted and returned to Mother Naturewhen you are finished with it. 2. Plain dye indigo and other colours have an irregular surface- traditionally all overbold block print/ mud resist was used to disguise this. We embrace it as part of the ‘handmade’ feel – you need to consider carefully if it works for you. 3. solvent free, water based pigment inks blockprint- any colour possible. We are very pleased to offer wholesale rates for larger purchases- contact us for details. Praveen has been a late bloomer in this field, starting to get hooked as we researched for our hands-on creative arts tours [ www.creative-arts-safaris.com ] It was when he discovered the existence of Fair Trade projects here in India that he really became inspired by what you could do for others whilst building your own business. You are welcome to visit our SHOP just ring ahead, please. +91 9982032755. Our shop is at our workshop- you are welcome to pop in for a chai and look around.